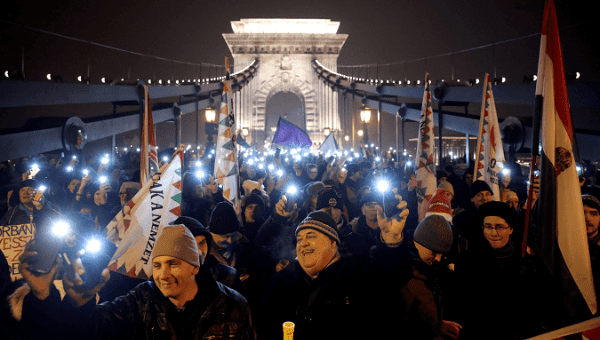 Thousands of Hungarians marched to the presidential palace Friday night to protest against reforms to the labor code, known as the “slave law” and the creation of new courts under control by the executive branch, through the Ministry of Justice. Approval of these two laws backed by far-right Prime Minister Viktor Orban and his Fidesz (Hungarian Civic Alliance) party angered a variety of groups. Last Sunday, 10,000 people protested against the reforms, arguing it went against the Hungarian people. Reforms to the labor code allow employers to ask staff to work up to 400 hours per year of overtime; these hours can be paid up to three years after having worked. The reform will go into effect on Jan. 1, 2019. The second law, which sets up administrative courts, will allow executive controlled courts to take over cases involving everything from taxation and elections to corruption and police abuse. The bill also strips Hungary’s Supreme Court of its authority over these types of cases. The newly created courts will be entirely separate from the current court system. They will be overseen by the minister of justice and rules will make it easier to fill the new court with judges loyal to Fidesz. The administrative courts will be able to rule in politically sensitive cases such as corruption and electoral law and freedom of assembly. On Friday, a rally led by spoof political party The Two-Tailed Dog Party (MKKP), which started outside Parliament merged with a demonstration staged by opposition groups. MKKP, launched over a decade ago as a joke, has become a semi-serious force, using ironic humor to tackle practical issues. “I wanted to come because I consider the Dog Party to be the most serious of all in the current lineup, which is rather sad,” said 26-year-old student Almos Edes. Friday’s rally also took aim at regulations that have led to the departure of the Central European University, founded by Hungarian-born billionaire George Soros, from Budapest, and at demands for an independent public media. “We can finally work eight days a week. We no longer need to hassle with independent courts. Homelessness has been eliminated. Irritating foreign schools will vanish. And Soros, Soros, Soros, Soros, Soros,” said an invitation to the rally posted on Facebook. Orban has said the protests have been partly stoked by activists paid by Soros, an accusation Soros’ Open Society Foundation has denied. Protesters were subsequently joined by another rally called by opposition groups and then marched up to to the office of President Janos Ader, who the two controversial bills. During the march, protesters briefly blocked a bridge crossing the Danube River. Despite the cold weather and the Friday night snow, protesters were out in the streets until 1 or 2 a.m. every morning. Unlike protests in previous years, police used tear gas during the demonstrations which angered protesters. Demonstrators used smoke-screen bombs, burned small handkerchiefs and newspapers and one window of the Parliament was broken by a stone thrown by a protester. These most recent reforms by the Fidesz government have provided a stronger base for opposition forces and citizens to join against PM Orban, challenging his popularity. According to an AFP report, trade unions are discussing support for a potential nationwide strike to protest the labor reform. Be the first to comment on "Thousands protest in Hungary against new reforms"